The most reverend Bernard Longley, the Archbishop of Birmingham, Your Grace, it is a privilege and honour for me to welcome you along with Father Dominic, Sister Luke, Canon Gerry Breen and William and Margaret Ozanne. It is a joyful afternoon for us all. We are in the Gurudwara’s main Guru Darbar or Court. This is where the Guru Granth Sahib Ji – the scripture which we revere as our eternal Guru – is enthroned. For the last 35 years, continuous prayer services have taken place in this Darbar throughout the week. These services are called ‘Akhand Paaths’, consisting of the continuous reading of the entire scripture without break, which takes 48 hours. You may marvel that there is a waiting time of 5 years to have an ‘Akhand Paath’ service here. Currently, bookings can be taken for 2017, if one wishes to have such a service conducted. The congregation, as you have seen, has just completed reading the Sukhmani Sahib or ‘Psalm of Peace’, from the Guru Granth Sahib Ji. It is attributed to our fifth Guru, Guru Arjan Dev Ji. We do this every Sunday and it takes about one and a half hours. Recognise the entire human race as one family. Live in a spirit of service to the One Creator; acknowledge One Universal Enlightener; accept that we are sparks of the same Infinite divine Light, whose radiance is latent within us all. Only an inspired mind, attuned to the Divine through the practice of one’s faith, can fully comprehend that we are all God’s children and that we are all, in a divine manner, inter-connected and inter-dependent. Thus, a multifaith approach is the only way to achieve harmony, coexistence and universal peace. Sikhs invoke blessings for the welfare of all of God’s children at every prayer, which for practising Sikhs is a minimum of 3 times a day – thus promoting one’s own beliefs, but respecting and wishing well for all. This helps to bring about harmonious relationships in today’s multi-ethnic, multi-religious and multicultural world. All Gurudwaras also have an open door policy because everyone should be made welcome in God’s house. Guru Granth Sahib Ji advocates that people should be strong in their respective, God-given faiths and help others to follow their own paths – with the common aim of sarbat da bhalla, the welfare of all. A key to enhancing interfaith cooperation is the need for places of worship, individuals and organisations to remain true to the principles of constant prayer and humble selfless service. Interfaith cooperation must be enhanced through a comprehensive education strategy that breaks down the seemingly insurmountable divide of ‘us and them’. This education needs to begin at home within families, through schools, institutes of higher education and ultimately be extended to politicians, legislators, governments and multi-lateral organisations. The interfaith arena must be at the forefront of campaigning for legislation that is both conducive and supportive of interfaith cooperation. Those within the interfaith context must take the lead in educating both their members as well as members of other faiths, about the commonalities between the faiths and the need to love and serve all of humanity. This will ensure that we are not just tolerant of others, but that we are prepared to accept and respect, both our own and others’ beliefs. Indeed, that we are able to sacrifice the self for the other. Such a deep spiritual bond is the best way to ensure that this century becomes the century of peace. Your Grace – the bestowment of the Knighthood of St Gregory XVI the Great on 22nd April of this year upon me, is etched deep in my memory and will be an inspiration for me throughout my life. I am extremely grateful for the same. I was honoured to attend last Friday, an annual dinner for Papal Knights in London, and before that I attended a five day Global Gathering of the Fetzer Institute in the holy city of Assisi on the theme of love, compassion and forgiveness. It is paramount that the dignity and honour of religion is restored through all means and initiatives of mutual respect and recognition. For too long, religion has been hijacked by a few through the processes of misrepresentation, misinterpretation, misquotation and misuse. What is much needed in today’s world is religious solidarity. In the 21st century, to be religious is to be inter-religious. Religious faith solidarity has been greatly promoted and accelerated with the Catholic Nostra Aetate declaration of 1965. Through the awarding of the Papal Knighthood on myself recently, and today with this second gesture of recognition by the Catholic faith, upon a Sikh citizen of Birmingham, religious faith relations have been strengthened. Respecting and honouring other individuals of other religious faiths, is action-orientated and goes beyond dialoguing. Your Grace, we have much enjoyed being members of the Birmingham Faith Leaders Group. It has been active and wise. The historic statement which was made against the War in Iraq remains worthy of applaud. You may have noticed that Birmingham’s Faith Leaders are prone to promotion! Bishop John Sentamu became the Archbishop of York, Archbishop Vincent Nichols became the Archbishop of Westminster and more recently Toby Howarth has become the interfaith advisor to the Archbishop of Canterbury. Who knows what else the future might hold! Birmingham – with its rich legacy of religious faith and cordial relations between members of the faith communities – has been a pioneer in developing an innovative locally agreed syllabus for Religious Education in schools. Its framework of 24 spiritual and moral dispositions support ‘learning from’ faith traditions, beyond only ‘learning about’ them. We are delighted that following on from this, our educational organisation, the Nishkam School Trust, will be able to impart faith-inspired education with a multifaith ethos in our nursery, primary, high school and sixth form. To conclude, may we commit ourselves, in a spirit of friendship and co-operation, to continue to work together for a better world. Your Grace, you have been most kind and considerate for taking the time to join with us today. 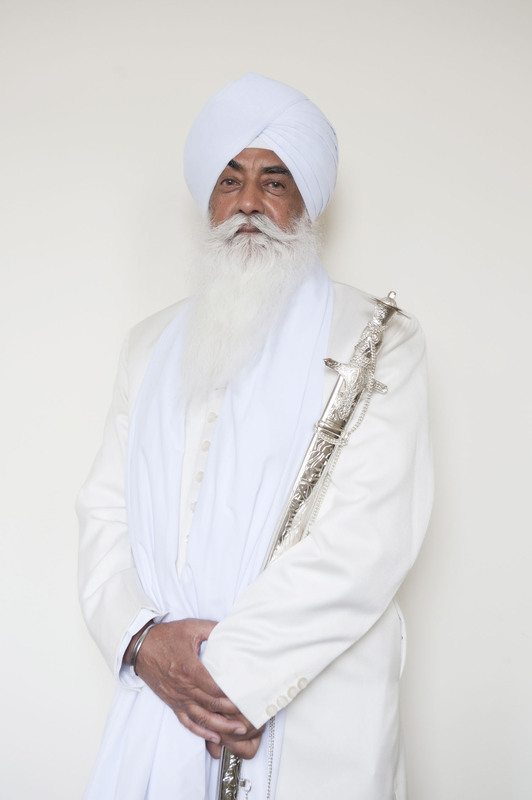 Allow me to invite you to present the award of Ubi Caritas to our Mr Sewa Singh Mandla, one of the elder pioneer members of our organisation who made history with the Turban Case of 1983, and is still an extremely active member of the congregation.